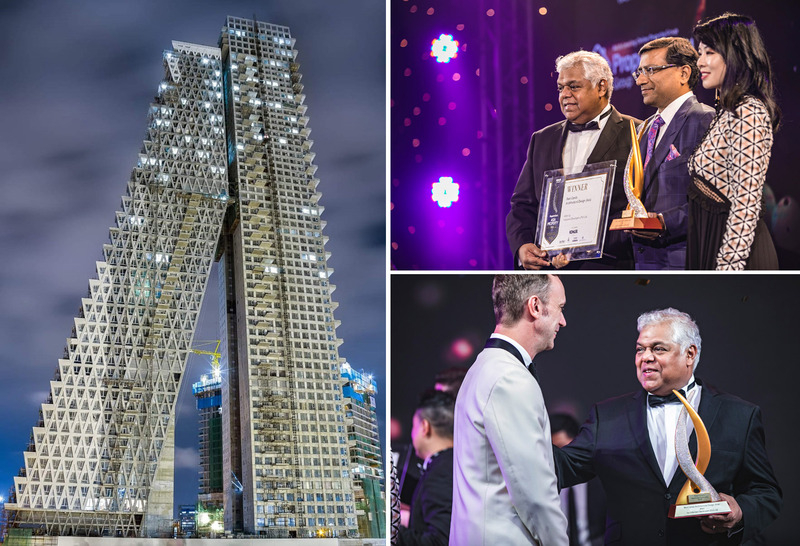 Sri Lanka’s contemporary architectural masterpiece Altair has beaten condominium developments in 15 countries in Asia including Singapore, Hong Kong, Japan, China and Australia, to win the ‘Best Condo Architectural Design’ Award at the 2018 Asia Real Estate Summit (ARES) hosted by PropertyGuru Asia in Bangkok, Thailand. Altair’s award was accepted on behalf of promoter Indocean Developers by two of the Company’s directors, Jaideep Halwasiya and Pradeep Moraes. Among the condominium developments that competed for the ‘Best Condo Architectural Design’ in Asia award were ‘8 St Thomas’ by Bukit Sembawang Estates Limited, Singapore; ‘Alpha City’ by Alpha King, Vietnam; ‘Glorious Mansion’ by Long For Group Holdings Limited, China; ‘Mount Pavilia’ by New World Development Company Limited, Hong Kong; ‘Scenia.Bay’ by Nam Tien Lao Cai Jsc. Co., Vietnam; ‘Sunplay The Heights Bangsaray’ by Sunplay Asia Limited, Thailand; ‘Stirling Residences’ by LN Development (Stirling) Pte Ltd., Singapore; ‘Taman Anggrek Residences’ by Agung Sedayu Group, Indonesia; ‘The CUVÉE’ by Chaopraya Mahanakorn Public Company Limited, Thailand; ‘The Smith’ by Triniti Land, Indonesia and ‘The Vales’ by Anchorvale Residences Pte Ltd., Singapore. Speaking at the awards event, Terry Blackburn, Managing Director, Asia Property Awards and Property Report of PropertyGuru noted that “Today, Asia has the fastest growing economies and most exciting real estate markets in the world, and the majority of award winners are Asian developers selling to Asian buyers and are helping millions achieve the dream of home ownership.” He also expressed the hope that the years the Asia Property Awards have spent promoting Sustainable Development, Green Buildings and Corporate Social Responsibility, have in some small way, contributed to the conversation on what the best Asia should look like in the future. The region’s biggest and most prestigious real estate awards series, the PropertyGuru Asia Property Awards are recognised as the ultimate hallmark of industry excellence in the Asian property sector. Headquartered in Singapore, the PropertyGuru Group is Asia’s foremost online property company and has been voted ‘Asia’s Most Influential Brand for Online Property Search’ by consumers. PropertyGuru helps over 16 million people find their dream home every month. The building comprises of two tower blocks, a 63-storey sloping tower which leans in to a taller, 68-storey vertical tower. Acknowledged as a new paradigm in contemporary living in Sri Lanka, the Altair building has already brought a new dimension in aesthetics to Colombo’s skyline and offers its 400 apartments spectacular views of the Beira Lake, the Indian Ocean and the city of Colombo. The development’s 1.5 million square feet of high-end eco-friendly living space is supported by 40,000 square feet of up-market retail space.